Sao Paulo-based Bueno lives and works in what he calls the "jungle inside," a living laboratory where nature and time meet. 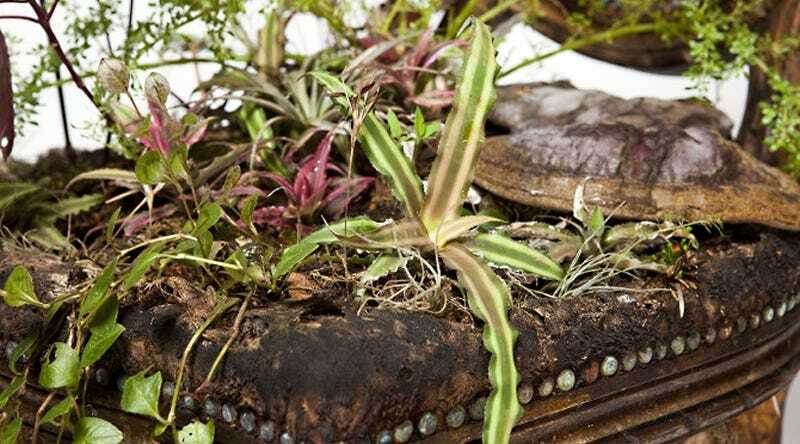 his studio is filled with reclaimed materials — mostly wood and plants collected from urban waste — which he transforms into installations, sculptures, paintings, and objects. Through the reuse of organic mediums, Bueno seeks to draw attention to the inherent beauty of the natural world, and allows space for a variety of senses, from touch to vision to sound. One of his recent creative endeavors has seen him untie colorful botanical life with furniture, intertwining bark, branches, and leaves into fabric cushions and chair legs. The quotidian objects come alive with new purpose, ever-changing in shape, size and color. The project description quotes Agnaldo Farias: "There is no death, but continuous transformation of states and chaining transmutations." Some questions remain unanswered (like, how do you water these things without bringing some kind of moldy-upholstery situation into the mix?). But there's no denying the evocative, nature-overtaking-civilization quality of these unique works of art.